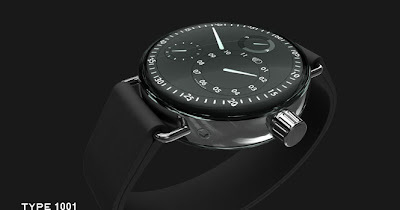 "Première at the Basel World 2010 show, the brand Ressence presents its watch with rotating dial plate, the 'platform watch'. Time is displayed by a flush mounted revolving dial that embodies all the graphical elements in one plane. 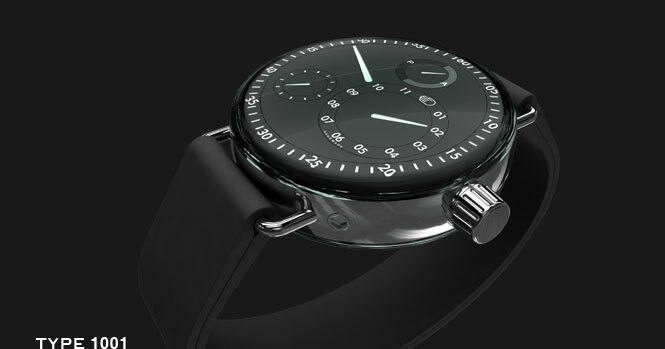 This innovative way to present time avoids superimposed information like hands covering an underlying dial, it visually prioritises time scales and enhances interface readability based on traditional cognitive patterns applied in watches with hand dials. Graphically, time seems to be displayed on the outer skin of the watch. The patented display system features a revolving module driven by a modified automatic Swiss caliber. The revolving dial plate points out the minutes, the lunatic sub-dials inside the main dial plate indicate the hours, seconds and am-pm. The sub-dials orbit around a virtual axis similar to the moons around Saturn." You can see a video of how it works here. via Perpetuelle.com where you'll find an interview with Benoit Mintiens, the maker of the watch.